In late September of 2008, I had the privilege of watching the courtship and mating of two pairs of tigers over a period of three days at Tiger Canyons. How the tigress's were able to synchronize their estrus cycles to within hours of each other, remains a mystery. If the synchronized estrus was a mystery, the synchronized births remain an even bigger mystery. At 100 days into their pregnancies, I separated the two tigresses, Shadow and Julie, into separate enclosures where they would be free from the males. For Shadow, I constructed a den site and placed a surveillance camera in the den, hoping to film the birth from the outside of the den. For Julie, I relied on my longstanding relationship with her and moved with her on foot, hoping to capture the birth on film wherever it might occur. 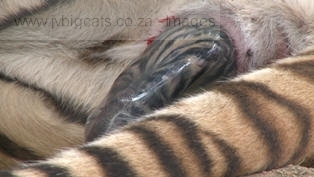 The reference books stated tigers gestation period to be 103 days. Day and night I monitored the two tigresses, concerned that the births might occur in the dead of night. Day number 103 came and went and nothing happened, perhaps the reference books were wrong. Lions gestation can go as long as 112 days. At 10 o'clock on the morning of the 104th day, Shadow went into labour and I positioned myself outside the den. I had seen a female leopard give birth standing, so in my mind the tigress would stand and give birth, the cub coming head first. How wrong I was. The first cub was born with the tigress lying down, and I was taken completely by surprise and missed the birth completely. 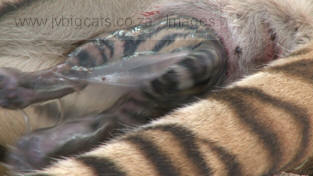 Shadow bit the umbilical cord, ate the afterbirth and cleaned the membrane off the cub with her rough tongue. 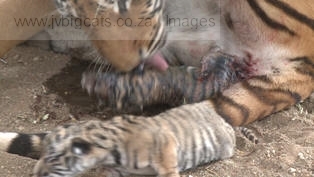 For a tigress giving birth to her first litter, she was doing surprisingly well. I was surprised how mobile the new born cub was. It immediately crawled outside the den into the hot sun and began to give a distress call. Shadow seemed unsure of what to do and remained in the den, now displaying some aggression towards me. After 15 minutes, I picked up the cub and brought it back into the den, hoping her aggression would not turn to fury and a possible attack. Bear in mind Shadow is not a tigress I can walk with. As I placed the cub in front of her, she thanked me with a continuous "chuffing" sound. I replied that was a pleasure to be of assistance in my best tiger language. Relieved I was still in one piece, I left the den. The second birth occurred one hour after the first birth and again she lay down as she delivered. 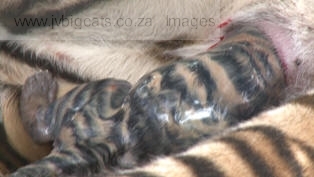 As I filmed the miracle unfolding before my eyes, I noticed the cub came feet first and the tiny claws on the back legs cut the fetal sack open like a surgeons knife. 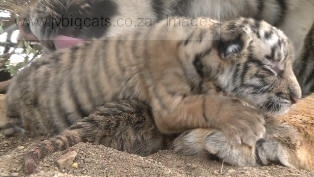 I had always wondered why young cubs had non retractable claws when they were small, now I knew why. 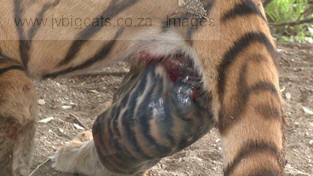 Rather like a young crocodile has a egg tooth on its snout to break open the egg, the tiger cub has razor sharp claws. Once again mother nature had taken care of the smallest detail. It occurred to me that the other births I have filmed, Wildebeest, Zebra, Topi, Impala and Thompson's Gazelle, all occurred in the midmorning. The theory put forward is that this is when predators are least active. Could it be that the tiger is synchronized to give birth when rival predators are least active. I waited another hour for a third cub, but nothing happened. Perhaps the litter was only two. Suddenly she stood up and went into a crouch position and began to give birth standing. For an instant the cub hung suspended in mid air in its fetal sack and then once again the claws on its rear feet cut the sack and lowered the cub gently onto the ground. Another miracle transpires before my eyes. Shadow, exhausted after three births, lay down on top of the cub, unaware that it was underneath her. How do I warn her, I tried English, I "chuffed", I cursed, I swore. Amazingly and unknowingly, I was now right in the den right next to her, but helpless to rectify the situation. The cub had the membrane over its head, the nostrils were blocked it was gasping for air through its mouth. There was no ways it could survive the weight of the tigress and then like a piece of soap it slipped out from under her body. Shadow gave an exhausted chuff and I replied with congratulations. 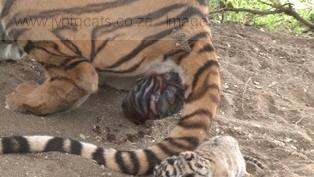 Tigress and human in a moment of time, experiencing the miracle of birth together. Certainly one of the most magical moments of my life and probably hers as well. When I think of the births of my own children, with gynecologists and mid wives in attendance, the tiger birth had seemed so uncomplicated, so easy, so natural. Human beings now number more than 6 billion while maybe 1000 tigers remain in the wilds. Worse still, there seems to be no plan so save them. After a fourth cub was born, lying down, I raced across to Julie to see if she wasn't perhaps giving birth as well. Julie was fast asleep, so I lay down exhausted and slept next to her. When I woke up several hours later, my first reaction was she has had the cubs and I have been asleep and missed the birth completely. Fortunately no births had occurred and no cubs appeared during the night. The next morning Julie was extremely stressed out. She was pacing up and down, trying to get to all the tigers that stood outside her enclosure. All of them were thin. It was obvious to me that they had not killed anything for a week or more. I gave Julie some meat, she immediately took the meat to the tigers and indicated to me she wanted them to have it. 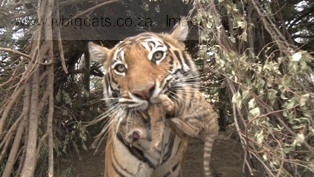 Julie's behavior was certainly not like a tigress about to give birth. She continuously talked to the tigers outside the enclosure. I would have given anything to have understood this conversation. I was confused, why would she want to give birth to cubs in an area where there were males who were not the father of her cubs and would kill them on sight. Then suddenly, at 10 o'clock, the same time as Shadow had produced cubs a day earlier, she went into a thicket and in rapid succession, produced 3 cubs, one of which was white. The den site was most unsuitable, on sloping ground with a river running through the bottom of the den. It was obvious to me that Julie had paid no attention in selecting the den site. The first cub rolled down the slope and nearly drowned. Despite its distress calls, Julie did nothing. I brought the cub back to her, but there was no response. After resting for an hour, she got up and abandoned the cubs never to return, despite their distress calls. On releasing her back to the hungry tigers, an amazing greeting scene continued for well over an hour and then all the tigers disappeared to go hunting. I had always believed that it was young inexperienced leopards or tigers that, when producing their first litters, would abandon them. I now think differently. If a leopard or a tigress is physically down in condition, or if environmental factors are against her, she will abandon. Just like human mothers will terminate an unwanted pregnancy, so too will tigresses do the same. I know that Julie is a good and caring mother, then why would she abandon? The answer lies in the fact that to raise 3 cubs is a huge physical commitment and a time consuming exercise. 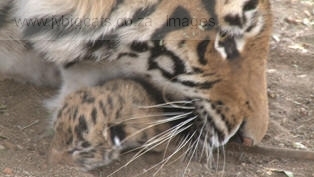 Tigresses must spend 80% of their time in the early weeks in the den with the cubs. Julie's reasoning is that she is the main hunter for the tigers at Tiger Canyons. Without her, the other tigers aren't coping. She is needed to hunt to ensure the survival of the other tigers. She cannot raise cubs and be a hunter at the same time, so she sacrifices the cubs. Julie also knows that Shadow is having cubs. 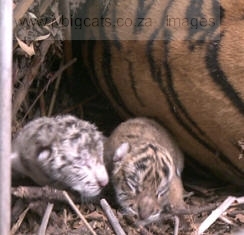 The father of those cubs is Ron who is her brother. Therefore Julie has a genetic investment in those cubs. It makes sense to let Shadow raise the cubs and commit the time, while Julie spends her energy and time on hunting. 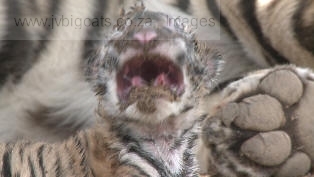 Tiger cubs are expendable. In the wilds, 30% never reach adulthood. If conditions improve, Julie will come back in estrus almost immediately and in 105 days can produce another litter of cubs. I was faced with a situation of three abandoned tiger cubs, one of which was white, the first white cub born at Tiger Canyons. But we are primates, emotional, "clever", dominant. When I posed the question to a group of people at Tiger Canyons, not one said "let the abandoned cubs die". The white cub has mystical, religious and financial connotations. 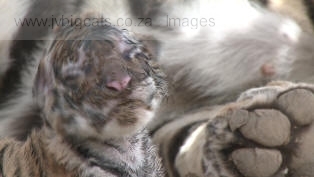 Could white cubs be relocated into wild tigress litters one day, helping to save the species? 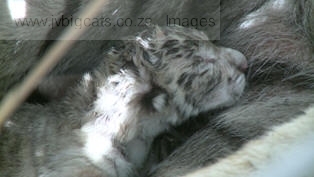 Could the white cub be sold to a zoo or even hunted one day as trophy for a vast sum of money? Money that could be re-invested into tiger conservation? Julie thinks unemotional survival for herself and the other tigers. John Varty thinks emotionally and by necessity, financially. I would venture that under the circumstances, the tigress Julie is cleverer than I am. Tiger Canyons desperately needs to fence off more land for the increasing tigers. This land needs to be stocked with suitable prey. This is very expensive to say the least. If the authorities will allow me to create another tiger sanctuary, I know I can save indigenous forests and river catchments in the province of Mpumalanga. This too will take huge amounts of money. As far as I know, Tiger Canyons has the only expanding, free ranging tiger population in the world. It needs new destinations to relocate surplus tigers. I need to create new tiger populations in the hands of private individuals, not governments who have failed so dismally to protect them. The rising global tourism, is the key to providing the money to conserve the majestic tiger. People will come from all over the world to view, appreciate and photograph this magnetic creature. 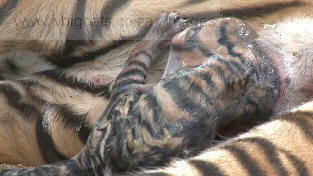 The week I spent recording the births of two litters from two tigresses, was extraordinary to say the least. 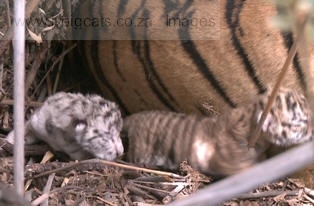 In summary, I was able to get into the tiny confines of a den with a wild tigress while she gave birth. Later I walked with her as she carried a cub to a new den site. I observed Tigress Julie take her meat and offer it to other tigers as she vainly tried to communicate with me that she wanted to be with them. Here I failed dismally to understand what she was trying to convey to me. On a TV monitor linked to a surveillance camera, I watched Tigress Shadow stand over her cubs like an umbrella, sheltering them from the rain in a huge electrical storm. 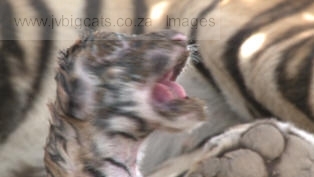 I saw a tigress meticulously remove the sand and mucous from a cubs nostrils, allowing it to breathe freely seconds after birth. I experienced an exhausted, emotional thank you from Tigress Shadow after I had brought a wayward tiger cub back into the den. I will never forget the blank stare, the penetrating gaze from Tigress Julie when I returned a near drowned cub to her which she did not want. I got the distinct feeling that she felt I was intruding into a situation I did not understand. 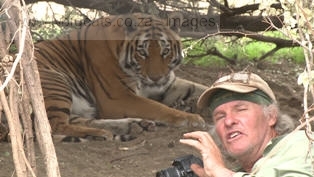 I experienced extreme anger at the human species, especially those that were blessed with tigers in their countries, that we have allowed this magnificent creature to almost slip to extinction. Tigers are far more intelligent than we think. They have the ability to reason, weigh up options and take decisions. They are decisive in their actions. At Tiger Canyons and perhaps elsewhere, they understand that their very survival is at the whim of human beings. It is an unenviable situation to be in. They instinctively understand, which we don't, that the land and hence the prey, is limited and to keep adding more tigers, decreases their chances of survival. In short, we human beings would do well to take heed that our continued expansion of our species on a finite planet, cannot continue for much longer. It has been a privilege for me to live with this magnificent creature, the tiger. This last week will live with me forever.